You can’t beat the combination of sweet roasted beetroot and salty goats feta in this classic salad. 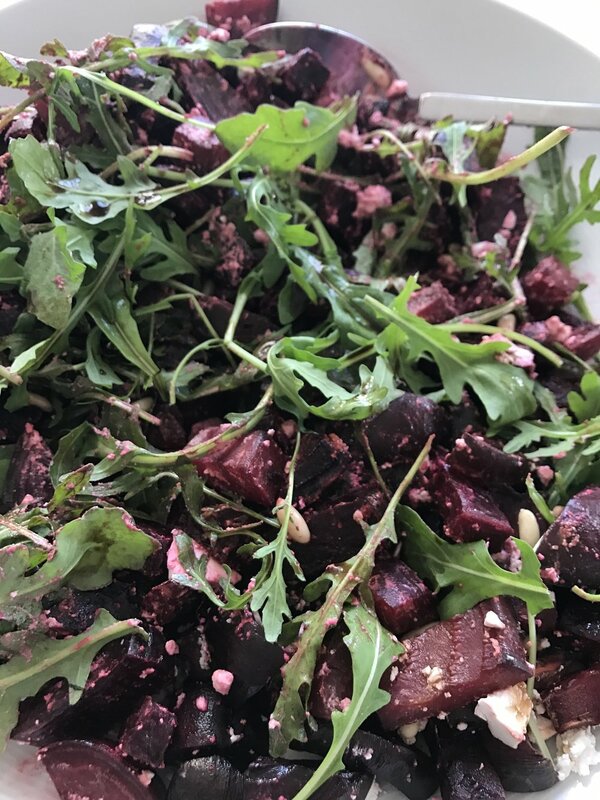 Perfect as an accompaniment to a BBQ, this recipe is one of our favourite ways to celebrate beet season! Big thanks to our nutritionist Emily White for supplying this salad. For more recipes from Emily, check out her blog here. 1. Place beetroot in a shallow baking dish and drizzle with oil and salt and pepper. Roast for 30 minutes or until tender. Allow to cool. 2. Once cooled add vinegar, walnuts, rocket and goats feta and toss to combine. Enjoy! Serve with your choice of protein-rich food e.g. grilled chicken or fish, or for a vegetarian version toss through chickpeas and lentils. To make this vegan-friendly, simply omit the feta cheese. Beetroot contains a high concentration of dietary nitrates, which are converted to the vasodilator nitric oxide within the body. Nitric oxide has shown to have temporary blood pressure-lowering effect, which may be beneficial for for those suffering with hypertension (1).